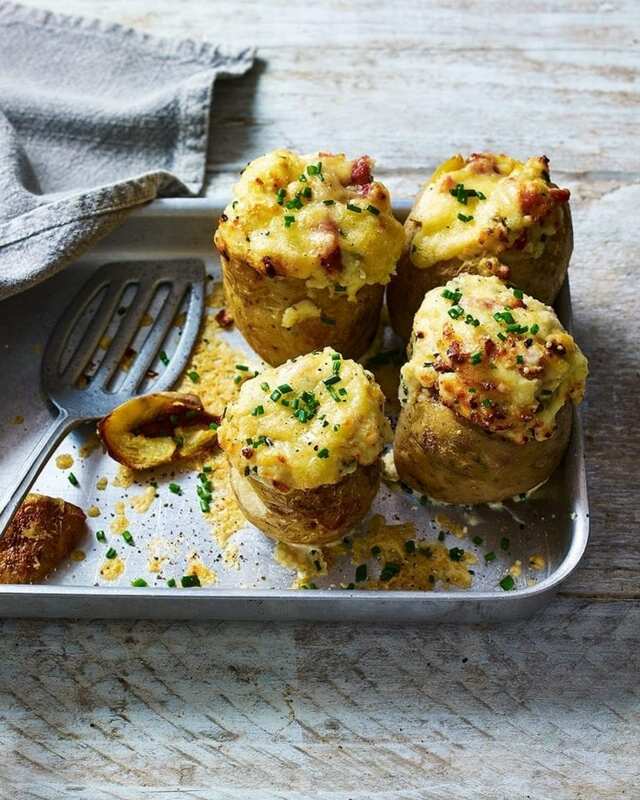 These loaded jacket potato skins combine cream cheese, cheddar, crispy bacon and a hint of garlic, in a wonderful winter warmer. Heat the oven to 200C/180C fan/gas 6. Prick the potatoes all over with a fork and cook in the microwave on high for 15 minutes until the cooked and tender. Let the potatoes cool a little, then scoop out the centre into large mixing bowl. Meanwhile, in a medium frying pan, heat a glug of oil and fry the onion over a medium heat for 5 minutes. Add the bacon and fry for a further 5 minutes until turning golden. Add the garlic and fry for 3-4 minutes until the bacon is crisp. Add the bacon mixture to the bowl with the potato, add the cream cheese and chives and mash everything together. Season to taste and spoon into the potato skins, then generously top with the cheese. Bake in the oven for 25-30 minutes until the cheese is melted and bubbling and turning golden. If you don’t have a microwave, bake the potatoes at 200C/180C fan/gas 6 for 45-50 minutes until the potatoes are tender. Precook the potatoes up to 24 hours in advance, leave to cool, then wrap in cling film and store in the fridge.